Aubie says we need your help to bag potatoes to feed the hungry, Saturday, March 5th come to Wesley Foundation Parking Lot at 131 South Gay Street in Auburn. It is easy to participate just bring your hands and a heart to help the hungry in your area. 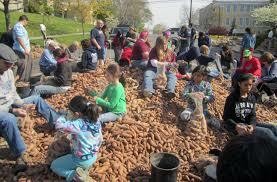 We will start at 8:00am and will work until the last potato is bagged or noon whichever comes first. Please invite all of your friends to join us. Lots of hands make light work. Contact Mary Lynn Botts for questions or additional information.